"... flies I will not leave home without...."
E-mail: jhanley1@chi.tds.net Jack enjoys fly-fishing anywhere there is water, both salt and fresh. He gets out fishing about 120 days a year, and when traveling on business he packs his fly-rod (or two). Jack's work has enabled him to fish in more than 30 states and several countries. 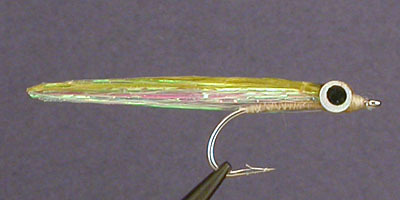 The Flash Minnow is one of three flies I will not leave home without. The other two are the Mohlon/Marabou Leech and the Clouser Deep Minnow. For me these three flies have been constant producers, catching everything from Tarpon to Tiddlers. They have accounted for more than 50 species I have caught "on the fly". Streamers are my favorite big fish fly. I learned from my fly-fishing mentor, Grandpa Foley, who loved his Mickey Finn and always said that "any fish worth fighting will eat a minnow". Lee Wulff's articles on tying without thread and his fascination with glues were likely responsible for starting me experimenting with hot glue guns, epoxies, and eventually Softex. 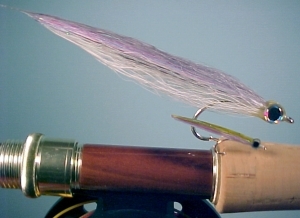 And I have been fascinated with shaping streamer wings ever since Nick Lambrou, one of New England's best fly designers and fishermen, showed me how to shape the back of a streamer with a little head-cement between my finger and thumb. With fishing buddies Bill Koladish (one of the sport's most innovative Largemouth and Striper fly creators) and Larry Alting, many hours were spent playing with the sink rates of Flash Minnow prototypes in the kitchen sink and in water glasses, as well as extensive field testing on the water. Together we have fished some pretty ridiculous experiments over the years, some so ugly that I slip downstream for fear of being laughed off the water. But in the J.B.L. Flash Minnow (named, of course, after Jack, Bill, and Larry) I think we found a real winner. At least it works for me! I think it will work for you, too. Larry and I had been chasing Stripers all night and just before daybreak the tide changed and we saw the water boiling with sand eels (lances). They were clearing the water as if Snapper Blues were tearing them apart from underneath. We fished in the pod for more than an hour, never hooking up. We left scratching our heads. The next night we made our way back to the same spot. Again, the water boiled. But this time, in the light we could make out a brownish 14" fish busting the skittering sand eels. "What's the smallest streamer you have with you?" "A Mickey Finn in the back of the Shad box. Try it." Well, Larry threw it about a hundred times with no luck, finally skating it with a double-handed strip until the only stupid fish in the bunch tried to commit suicide. It's a brown trout! I told Larry to bring a 4Wt and some 5X tippet the next day, and I would bring the answer. I spent the afternoon at the fly bench refining my latest experiment, matching the hatch not only in size and color but in sink rate and action. When dawn broke, I was able to hand Larry one of the prototypes. I had made six different sink rate versions of the same fly. Larry started with the floater, and over the next hour all hell broke loose. There wasn't 20 seconds when both of us weren't hooked up. As the frenzy started to subside Larry looked over and said "I just landed and released my 50th fish!" I had caught only 41, but had continued to experiment through the frenzy. As we walked back to the car Larry asked me the name of the fly. I responded: "I didn't have one until today…. Perhaps we'll call it Jack and Larry's 91!" Hook: Because bass and stripers are "head-hunters", I prefer a short-shank hook with a wide gap. For trout and salmon, try a 2X to 4X long hook. Or, for the best weedless fly you'll ever use, try a keel hook. It slides right over lily pads! Weight: None, or various amounts to achieve desired sink rates. For middle depths, try some lead on the hook shank. For deeper depths, try a cone head under the epoxy eyes. 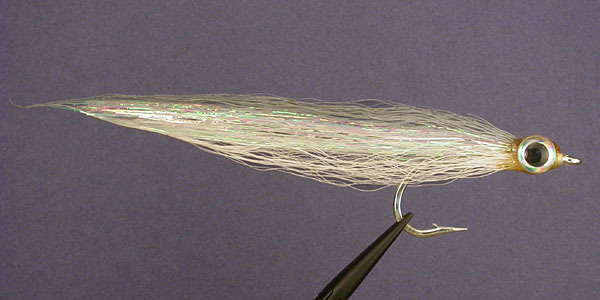 Body: Polarflash topped with darker bucktail, both to match the hatch. Eyes: Over-sized Holograph. I believe big fish key in on the terrified big-eye look. Head Cement: Epoxy which also holds the eyes. Body Shaping: I use Softex. Using your finger and thumb, shape the rear third of the body into a baitfish shape. This shaping also eliminates the materials from fouling around the hook bend. Shape the entire body if you are seeking a spoon-fly look. Cover the water thoroughly by using different sink rates. A relatively fast strip seems to work best.